Synonyms: Averrhoa acida, Cicca acida, Cicca distichus, Phyllanthus ditichus. Other names: Amlak, grosella, Malay gooseberry, Tahitian gooseberry. Otaheite gooseberry is believed to have originated in Madagascar. However, this plant can be now be seen growing in tropical and subtropical regions all over the world. Being sour and astringent, the fruit is not eaten fresh like other fruits but is popularly used in several food preparations in India and South East Asia. 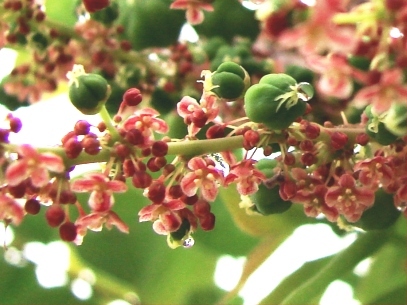 A large shrub or small tree, 2-9 m high, with spreading, dense, bushy crown of thickish, rough, main branches and clusters of deciduous, greenish or pinkish 15-30 cm long branchlets. Leaves alternate, short-petioled, ovate or ovate-lanceolate, pointed, 2-7.5 cm long, thin, green and smooth on the upper surface, blue-green with a bloom on the underside; altogether giving the impression of pinnate leaves with numerous leaflets; there are 2 tiny, pointed stipules at the base of each leaf. Flowers small, male, female, and some hermaphrodite, 4-parted, rosy flowers, borne together in little clusters arranged in panicles 5-12.5 cm long, hanging directly from leafless lengths of the main branches and the upper trunk. Stone embedded in the center is a hard, ribbed stone containing 4 to 6 seeds. 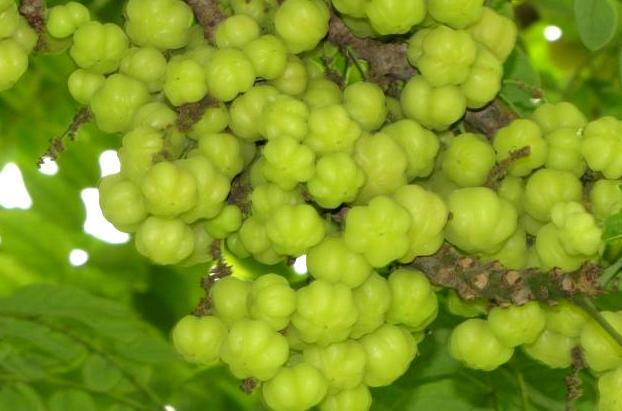 Otaheite gooseberry fruits are generally too tart for fresh eating but are esteemed for jellies, preserves and pastries. The juice can be used in beverage, or the fruit pickled in sugar. When cooked with plenty of sugar, the fruit turns ruby red and produces a kind of jelly. It can also be salted. Though it is closely related to amla (Emblica officinalis) which ranks third highest in vitamin C content, but the vitamin C content of Otaheite gooseberry is not even 5 mg per 100 g of pulp. The fruits can sometimes be seen being sold in towns of South India. Many tribal traditional healers in the Central Indian state of Chhatisgarh ascribe Otaheite gooseberry valuable medicinal properties. 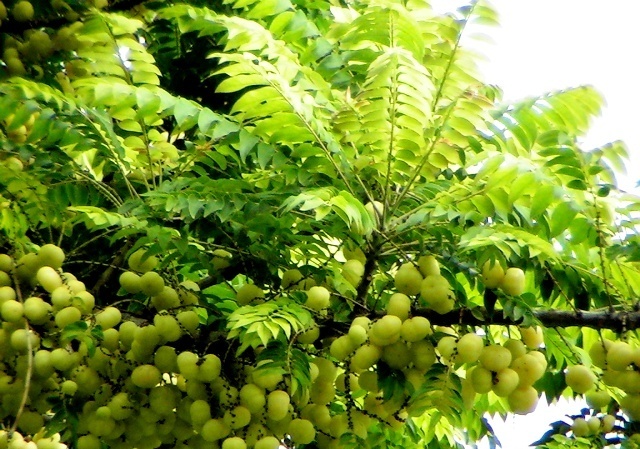 Though there are no commercial plantings of Otaheite gooseberry, but trees are often planted in home gardens as an ornamental plant and the fruits are harvested. Though the Otaheite gooseberry can grow on a variety of soils but it seems to prefer moist soils. New plants can be raised from seed, cuttings and air layering. The seedlings come into bearing in four years.